If you are worried about the security of your Windows based phone, then you should install Anti Theft SMS Alarm on your phone immediately. 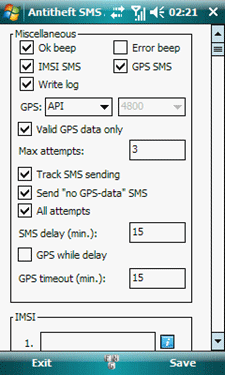 Anti Theft SMS Alarm is a free application for Windows based phone. It helps you track your lost or stolen Windows Phone easily by telling you the exact location of your phone. Its working is simple. Once you install and configure it, it will automatically run at startup. Each time the phone starts it will compare the SIM-card to determine if its a new number, which doesn’t belong to you. If it is a stranger’s number, then it will send you an SMS on a predefined number. The SMS will contain the phone number of the inserted SIM, the IMSI (subscriber identity can help to strip the police or the operator) and GPS coordinates. You can then use the phone number of the new SIM, the IMSI and the GPS coordinates to trace the phone’s location. To learn how to install, configure, and download Anti Theft Alarm, visit this page.